Watching elephants perform may look like family fun, but for elephants and other wild animals, the experience is anything but! Join us and the voice of this video, Selma Blair, at http://www.whatelephantslike.com/ in the fight against performing cruelty; and keep animals where they belong, in the wild. 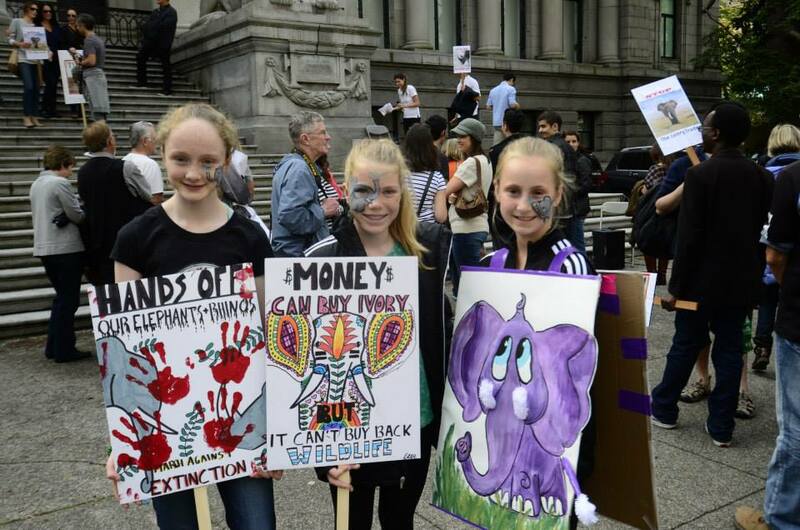 My nieces Ella and Taya have been great supporters of the Global March for Elephants and Rhinos. This post is a collaboration between the two. Ella wrote it in French and Taya translated, edited and added her editorial precision to the content of this piece.It’s a work of real collaboration. My niece Ella she has been raising money, marching, and giving talks to her friends and fellow students about the crisis facing Africa’s wildlife. This was written after the girls visit with their family to Kenya this spring. I think they’re remarkable, Ella is 12 and Taya is 14. I’m asking you, if you love elephants, rhinos, and animals, are you doing everything you can to help them? My family and I recently went on a trip to Africa. While we were there, we saw some amazing animals and surreal sights. 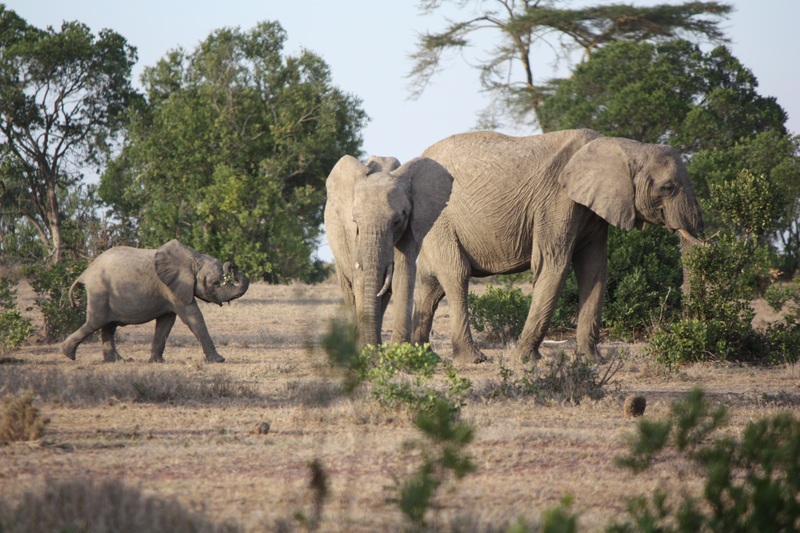 Some of the most fascinating animals we saw were the eight elephant herds, and about twenty five rhinos. I find that it’s crazy to think that, at the rate we are going all the rhinos will be extinct in ten to fifteen years and that in fifteen to twenty years,elephants will be gone as well. One of the worst things about this crisis is that we, as humans, are in full control over this problem and over their lives. The two main reasons for their disappearance are ivory poaching and habitat loss. Ivory poaching is what I find really astounding. How could people want to kill these beautiful animals for their tusks? And then they use them as a symbol of their high social status, or to show people they have money. There is still hope of ending ivory poaching, but with every day that goes by, their chance for survival decreases. Did you know that in the last one hundred years 95% of the elephant population was killed for their ivory tusks? 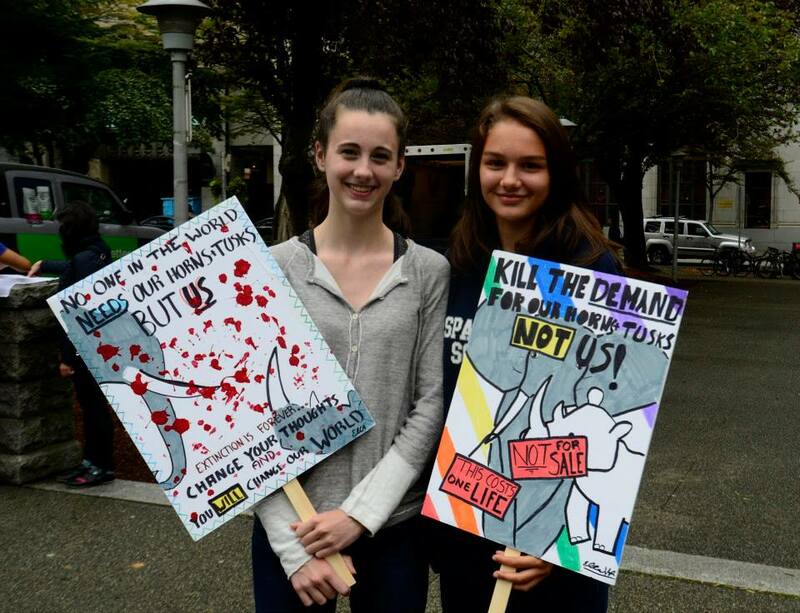 And up to one-hundred elephants are killed each day. There are now only about 400,000 African elephants left in the world. Maybe this number seems big to you, but it is actually quite small compared to how it used to be. In 1940, only 75 years ago, there were about 3 to 5 million African elephants in the world. Rhinos are in greater danger because many they are rapidly approaching extinction. The main reason that rhinos are killed is because their horns are believed, by many countries, to be a cure for disease. For example, in Vietnam, they believe that rhino horn can cure cancer. However, their horns are made of the same thing as our nails, so biting our nails and using rhino horn for the treatment of diseases has virtually the same effect. For some time, it appeared that there was hope for rhinos. In 2002, the number of rhinos killed was 25 which was surprisingly small. It kept improving each year, and in 2006, ten rhinos were killed. In 2007, that number went down to seven and it looked like an end to rhino poaching was approaching. 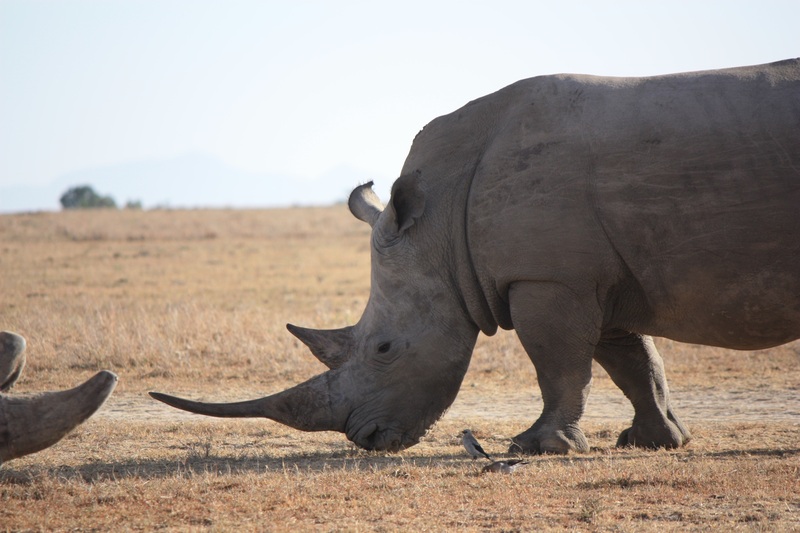 However, since 2008, the numbers of rhinos killed each year has dramatically increased. 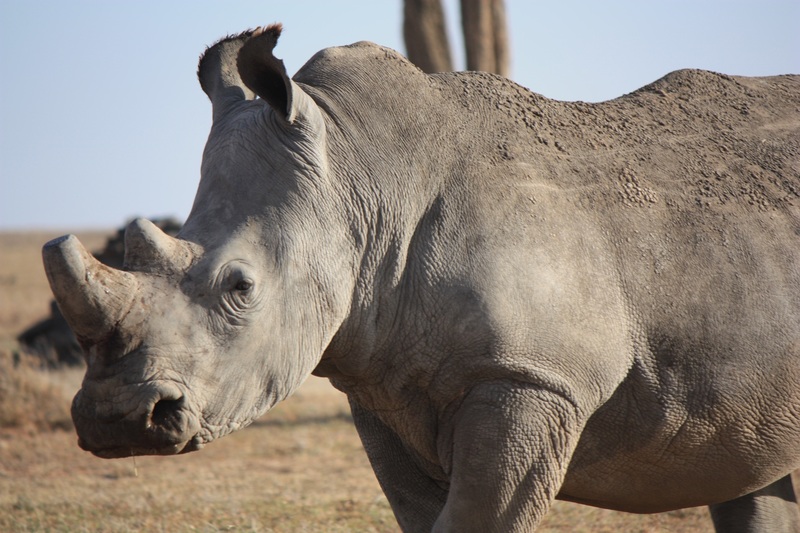 The years following “the big improvement”, the situation has gotten worse, to the point where, in 2014, we have killed 1215 rhinos for their horns. In Africa, we were able to see one of the five remaining northern white rhinos left in the world. We also saw the southern white rhino, and the black rhino. There is no hope for the northern white rhino, as they have tried to introduce them to each other and they will not mate, They will be officially extinct as soon as the five remaining rhinos die. The black rhinos are also endangered, with 4,848 rhinos left. The southern white rhino came back from an extremely close call with extinction and they now have a status of a near threatened species with 20,000 southern white rhinos left. The poachers, even though they are the ones who kill elephants and rhinos for their ivory, are not the main reason for the approaching extinction of these animals. The big problem we face is the consumers. Their demand for ivory is the main reason these species are endangered, as without the high demand, the poachers have no reason to kill the elephants and rhinos. 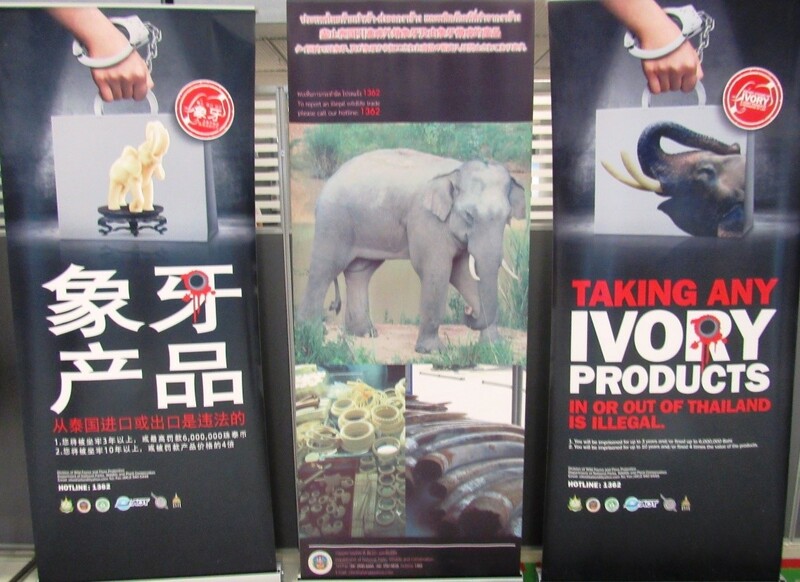 The posters had an outstanding impact on people’s views of ivory. Another survey, this one in 2013, showed that the posters had been seen by 75% of the population, and the number of high-risk consumers of ivory (those who are most likely to buy objects made of ivory) had been cut in half. There is still hope for the animals if we act fast, and are committed to making a difference. When my family and I were in Africa, we saw many incredible things, but there is one memory in particular that stands out. 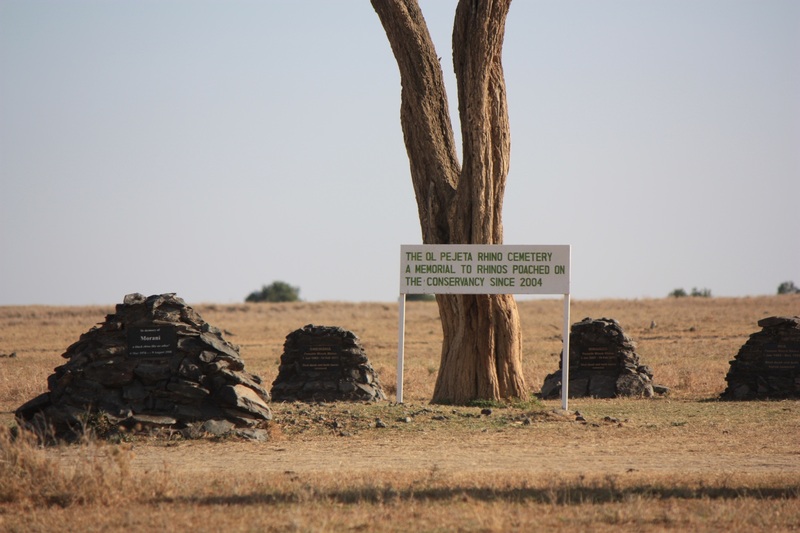 While we were driving through the plains, we came across a group of about eight rhinos. We drove a bit closer, and we saw eight piles of rocks there, under a tree. There was a sign beside the tree. That was when you fully realize the effect of poaching on these animals. The rhinos had a life before they were poached; they had a family, friends, and others who would remember them, much like us. Their death affected the other rhinos, just like the death of someone we knew and cared about would affect us for the rest of our life. We need to save these animals while we can. There is still hope, but how long will it last? Guest post by elephant ambassador Leanne Fogarty currently traveling in Thailand. than a jerky, one-hour ride where you can only just see the back of its scarred head. Part of the “Phajaan” process involves hitting the elephant with long sticks that have sharp nails on the end. 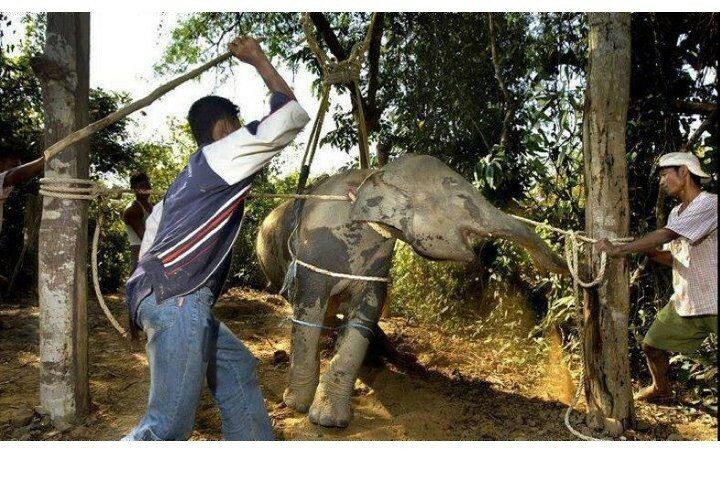 Just one part of the horrific “Phajaan” process involves hitting the elephant’s sensitive areas (like its face and trunk) with long sticks that have sharp nails on the end. Source: unknown. List of elephant sanctuaries by country. The following guest posts are written by Leanne Fogarty, an elephant ambassador and advocate as she travels through Thailand. Finally. Nineteen hours, 11,800 km and now I am in Bangkok. I have 2 weeks in Thailand. One week in beautiful Koh Tao (Turtle Island) and one week volunteering at an elephant freedom project in Surin. The Surin Project is run by the Save Elephant Foundation – better known for its Elephant Nature Park near Chiang Mai. The ENP cares for 42 injured, old,or formerly abused elephants from the logging and tourism industries. Volunteers stay for a week or more, working for the “chang” (elephants) instead of the other way around. The volunteer’s donations fund the huge costs of providing medical care, a healthy, varied diet and hundreds of acres for the eles to roam. In the wild elephants can walk 24km a day. There is no elephant riding at ENP. The volunteers plant food for the eles, harvest and cut up the food, pick up dung, wash and play with the eles in the river, and walk beside them. Basically the Park lets eles – finally – BE eles. 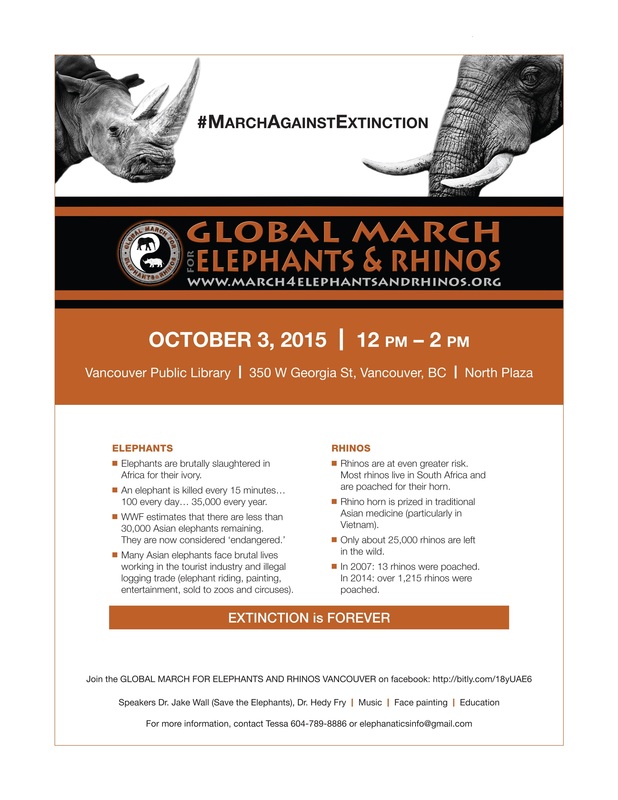 As soon as I retrieve my bag and head for the exit, 3 huge anti-ivory posters block my path. Impressive! So it IS true. Thailand is working on its contribution to the poaching crisis. Let’s hope it also becomes sensitive to the abuse of its elephants in the name of entertainment and the mighty tourist dollar. 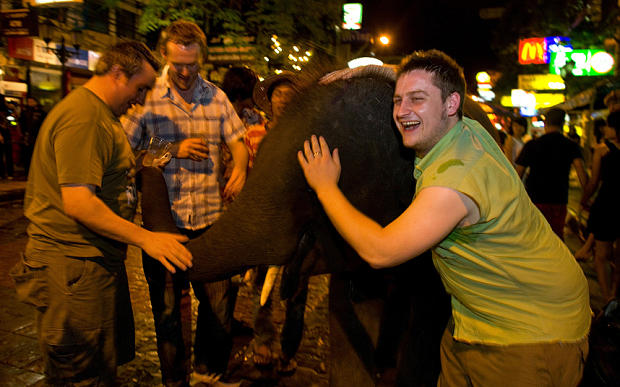 I have been shocked by the number of people I know who have ridden elephants. I’m even more shocked that they have no of the dark side of animal tourism…those days need to be over. We know too much about so many animals, particularly elephants. The more we know, the less we will support tourism that is based on animal abuse…and hopefully put our money towards appreciating seeing animals in their natural habitat and supporting the communities who are an integral part of this. 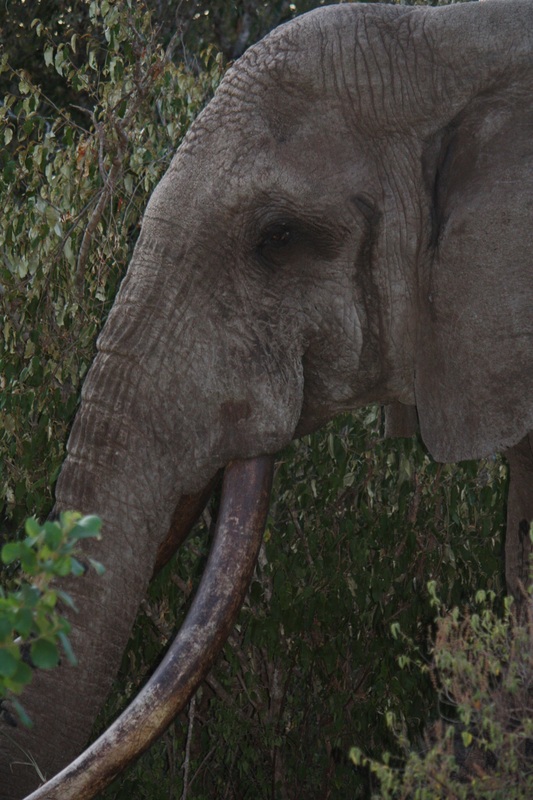 You can also find a guide to elephant sanctuaries by country right here. 3) Are you IN South Africa? Please show up! 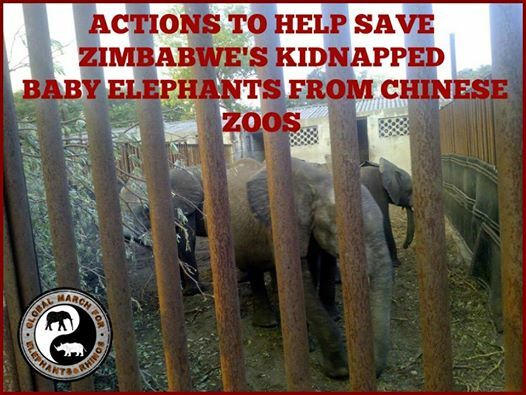 There’s 3 protests on December 19th outside Zimbabwe consulates for the kidnapped elephants, in Cape Town, Pretoria and Johannesburg!